In February 2013 we purchased our lakefront property at Cedar Creek. In May we broke ground. By mid October 2013 we spent our first night in our dream-come-true retirement house. And, as crazy as it sounds, we did all this from 1600 miles away! It never would have been so effortless and successful if not for James Parks, his company, and the awesome folks that work for him! We had met James Parks prior to buying the property while considering the purchase of pre-existing homes. We happen to tour several of his houses and fell in love with their quality, detail, and style. After much consideration, and with many recommendations from local folks (including our real estate expert Buck Gentry and a sub-contractor that we ran into at one of the job sites), we decided to take the leap and have Parks Construction build our retirement home. Best decision ever! James Parks was with us every step of the way guiding and advising, answering each and every question, and building our confidence that we could and should take on this endeavor. He personally came out to the property with us to assure us that he could build the home we wanted on the lot, he directed us to an architect and gave design suggestions when needed. He supplied quality, dependable contractors to do the work (all of whom treated us with the utmost respect and attention when we visited the job site 3 times during the building process!). But, by far, the best move he made was assigning a site supervisor to our build that became our eyes and ears throughout the construction period. Garrett (with some assistance from Earnest) were top quality supervisors who gave us the confidence to build from half way across the country. We had several long phone calls with Garrett where we had the chance to relay exactly what we wanted done at the house. From that point on, it was like having a family member working down there keeping an eye on everything and keeping us informed, both verbally and through pictures! We firmly believe that the experience of building the house was so much easier, and the beautiful home that we dreamed of became reality because of Garrett’s efforts, attention to detail, and determination to have our wishes carried out. So, a huge thank you to James Parks, Garrett Woodward and the rest of the Parks Construction team that put their time and talents into building us our dream-come-true retirement home down there at Cedar Creek Lake. I write this letter in recommendation of Parks Construction as a general contractor. My husband and I had the pleasure of working with James, Garrett and the other members of the Parks Construction team on the building of our new home. Throughout the building process, the employees at Park’s were always very helpful and prompt in answering any questions we had. They also did an excellent job in working with us to ensure we received the best deal possible while still staying within our budget. Garrett did an excellent job in managing his sub-contractors. He was also wonderful about letting us know well in advance when a decision was going to need to be made; therefore, allowing us to take our time and pick out what we truly want, rather than rushing through to meet a deadline. The entire building process went a lot smoother than I ever anticipated. I have always heard “nightmares” about using general contractors to build a house, but I can honestly say that Park’s Construction made the process easy. I would highly recommend Park’s Construction for all of your homebuilding needs. I can’t thank you and your team enough for the wonderful house you built for us. We came to you with our own plans after a very bad experience with another builder not being able to get started. Even on a shortened time frame you made it happen for us. All the costs were itemized line by line. That helped us greatly since we were paying for some of the items personally. There were no surprises or unexpected up-charges. I liked that you recommend email correspondence to avoid confusion and ‘he said, she said’. Then again, Aubrie and Garrett were always available to answer questions…Your team of professionals gave us valuable input from the framing to the placement of the plugs and switches. They are all consummate professionals, and the customer definitely comes first with them. I appreciate your coming out personally to inspect the progress. We saw you here on numerous occasions. You have a keen eye for detail, and caught several items that we had totally missed. You really do care about the homes you build. .. Thanks again to you, Aubrie, Garrett, and your entire team for making us very happy in our Parks Home. I would recommend you to anyone and everyone. We would like to thank you for building our beautiful home. From the beginning you were so helpful by recommending Stan Williams to design our house.This was our first home to be built from the ground up and it was what I thought would be a terrifying experience. You assured us at the beginning it would not be and to just relax and enjoy the process. Looking back you were exactly right. You seem to know what we would like and all the choices you made was absolutely perfect. Working with Garrett, Earnest and the contractors was great. They would answer any questions we had and would explain so we would understand. You did things in the house we didn’t expect and they were great. You did everything you said you would do and more. It was a great experience. We would recommend Parks Homes to anyone anywhere. prettiest home on Cedar Creek Lake. I will concede only to the Park’s manse. Pleased, happy, thrilled, does not begin to describe how I feel about this home. It passed dream home long ago and even little piece of heaven. 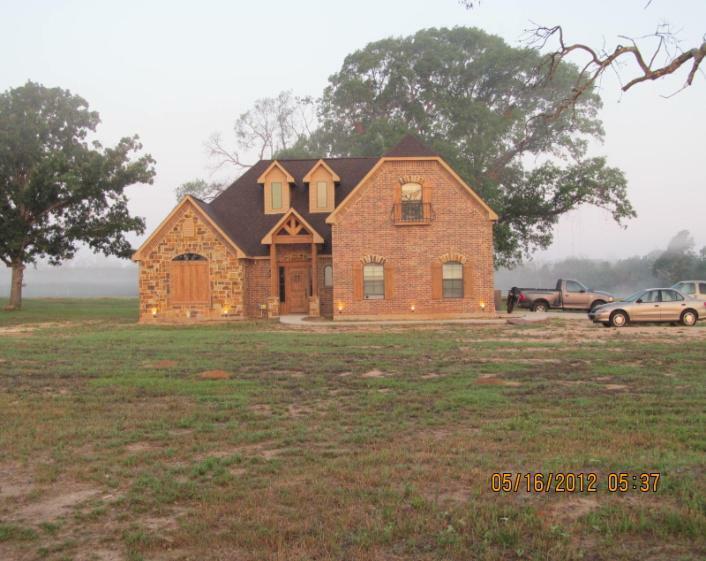 Construction on our home in Gun Barrel City, Texas began in October, 2011. We moved into our new home in January, 2012. We have been very pleased with the quality of construction in our home. We have good memories of the relationship we had with you as construction was planned, implemented and completed. One of the things we much appreciated was you kept your word every time you made a promise to us. We never had to be concerned that you would not deliver the quality promised in the construction. We also valued the patience you showed in allowing us to make the dozens of tough decisions in construction without feeling pressed or “led.” Thank you for your expertise in guiding us when we wanted upgrades. Your helping us get fair pricing with subcontractors was very helpful. It was refreshing to work with a customer-friendly builder. You maintained a positive attitude throughout the construction process. We felt we could talk with you about every aspect of the construction. When you added quality above our requirements [brick and stone mailbox, specialized trim, and electronic garage door], we were pleasantly surprised. Thank you for suggestions about guttering and landscape that added value to our home. Lastly, when we have contacted you about some problems with the water heater, you replaced it with no hassle and on a timely basis. When an air conditioning drain stopped up, you sent the service man that day and the unit was serviced with no charge to us. Thank you for work well done and for your friendship. I highly recommend you to anyone who is considering construction. I want to commend James Parks and Parks Construction for the absolute fabulous job on my custom built home finished in January 2012. From design to finish the whole experience was wonderful. James was not only my builder, but had numerous resources for financing and design also. I am very happy with the quality of my two story house and feel that I got a lot for my money. I will probably build another house within the next few years and Parks Construction will most definitely be the builder. As an example of James’s great customer service, my house was broken into and damaged after I moved in. James heard through the grapevine of the incident and had three of his workers out there to secure my home before the Police had even left. Thanks James to you and to all your employees for making building my home such a rewarding experience. We purchased our home in late 2010 from Parks Construction after viewing over 40 homes in our price range. We were impressed with design and upgrades included in the price of the home. The home included granite countertops (not only in the kitchen but bathrooms and living room as well), upgraded fixtures, attractive moldings, eco-friendly windows, and much more. We have lived in our home for over 2 years now and we have not had any major problems. Any small issues were handled quickly. We recently completed a lake home remodel with Parks Construction and can state without any reservation how delighted and fortunate we feel to have met and put our trust into James Parks and his company. The project was from our point of view was extensive and came with some real unknowns due to the age of the home and the many prior add-ons etc. James recommended and expertly supervised the details of taking down a problematic portion of the original home to the lot, followed by pouring a new foundation which was then connected to the existing structure. So many prior issues were fixed by his recommendations. I can’t say thank you enough! A new family room, laundry room, powder bath and master bath and closet were added by the new addition. Other work included raising ceilings, leveling and tiling floors throughout the home. We actually were so pleased with the work and value that we added a master bedroom, kitchen and another full bath remodel to the scope of the project. Again, I can’t say enough about how well everything came out. We just love the end result. Everything was done within the time first estimated by Mr. Parks and on budget to our original specifications. Regarding the budget, James early on said he would not nickel and dime us to death and I can report…He kept his word!! I also must compliment his supervisor- Garrett, the painters, framers, plumber, electrician, flooring and tile and granite fabricator. They were so responsive to me and most importantly to my wife. Everyone was respectful, demonstrated patience, and cooperation throughout the build out. It was obvious everyone wanted us to be pleased with their work!! My wife and I are real believers in James Parks Construction and would not hesitate to ask him to build another home for us. Good news if you are looking for a high quality but affordable house, you have found your builder. Stan Williams did the design, managing to take our suggestions and make them into a workable plan. He also recommended we look at James. He said he was a young, energetic builder who produced a well made home. After speaking to a few other builders and looking at examples or their work, We decided to take his advice. We could not be more pleased. Everyone associated with his company has been very professional. Their work has been excellent and they are a pleasure to work with. This is our third build from dirt and we have also completely remodeled a 4000 sq foot home in Tucson, Arizona. It has been our best experience. If you have any questions, please feel free to call me or better yet, come see our lovely home. I was introduced to James Parks, President of Parks Construction, Inc., in April, 2011. As a result of my wife and me searching for a lake house in the Cedar Creek/Athens area, and not finding an existing home, we decided to look into building a custom home. Through the realtor I was working with at the time, we received the name of James Parks, with a brief introduction that “he was the most reasonable builder around and had been in the area for a good amount of time”. Hindsight has proved that this introduction was not only a God-send, but also the beginning of a very successful and rewarding relationship. Parks Construction built a beautiful lake home for our family, located on Water’s Edge Ranch in Athens, TX. This is our dream house! My wife and I conceptualized our vision and proceeded to find drawings and specifications that came very close to matching our vision. However, to make it perfect, we needed to do some “tweaking”. As a first step, James Parks worked closely with us to finalize that vision. In addition, as a result of James’ advice that “we first needed to find the location/lot that felt right”, and his extensive knowledge of available land and assistance in searching with me, our Moretti Castle now sits on a 1.1 acre residential lot with 125 feet of lakefront in a secure, gated community. Throughout the entire construction phase, James understood exactly what we wanted and made expert and informed recommendations regarding the appropriate materials to use, the latest interior design concepts, etc. He even recommended a landscaper for us. James is professional yet personable – and he quickly became like one of the family! He and his entire crew are trustworthy and dependable. They built our home on schedule, on budget, and with quality workmanship. We cannot be more pleased with our Castle – it is everything we wanted and more! I highly recommend Parks Construction, Inc. to anyone looking for a talented, experienced, trustworthy, and dependable builder. James Parks, with Parks Construction built a small lake cabin that we purchased. We decided to build a larger lake home. We were impressed with the quality of the smaller home and the fact that James stood behind his homes. There were a couple of minor things that we called James about and he would have his men there the next day. Also, a mutual realtor friend recommended Parks Construction and the price per square foot sounded reasonable. So, we also hired Parks Construction to build our new lake home. James and his crew were respectful and courteous throughout the building of our home. He was available to answer any questions or concerns. The construction of our home was completed in four months, which is a shorter amount of time than most home builders. James and his superintendents were easy to talk with about any changes or concerns and would fix the problem if at all possible. After the contracted construction, we decided to add a very large covered patio and James priced the project less expensive than most contractors would have. We are very pleased with our new lake home. It is beautiful and well built. There have been a few normal things that have occurred since we built and James continues to be a man of his word and to stand behind his homes. I want to offer you a letter of recommendation for your files as it pertains to the grand adventure we enjoyed as Parks Construction built our new house. We had been in the planning stages for several years and had changed the house plans too many times to remember. Once we got to a point where we thought we were done with the major changes to the plans we sought bids from multiple builders in the lake area. You were one of those builders as we had been watching and inspecting several of your projects in the Cedar Creek Country Club and were very satisfied with what we saw. We set up a meeting and presented our plans to you and were surprised that you could provide a price as quickly as you did, while other builders took as long as a month to put a quote together. After our initial meeting we concluded that we need to reduce the square footage and went thru one more change to the plans. After that we were comfortable with the revised quote and proceeded to pursue financing. I cannot say that this phase of the project was enjoyable but let’s fast forward past the closing of the construction loan. The slab was poured in mid May 2012 and framing began soon after. I presume that our project was not typical for you as we were building on our property, a property with an existing house that we were still living in. We were able to watch the daily progress first hand as the job site was only 50 feet out our back door. We became very familiar with each of the crew members and subs and felt very comfortable interacting with them as well as the project managers when things came up that required a decision. We are very happy with the quality of the home as well as the craftsmanship. If I were ever to build another house I would use Parks Construction without hesitation.